Changes in metadata can cause your tasks to stop working correctly. Each time you open a task for modification, RETS Connector checks the server for new metadata; if the metadata has changed in such a way that your task can no longer be run, RETS Connector presents you with a series of dialog boxes to help you diag­nose the problem and adjust your task to the new metadata. • Click Yes to acknowledge that the metadata has changed. The task then opens for modifications. • Click No to remove the media download request from the task. The task then opens for modifications. • Click Cancel to stop the task from opening for modification. 2. 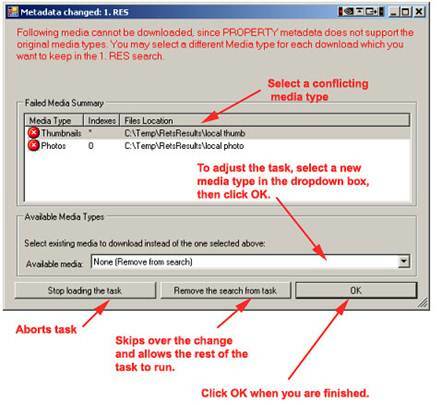 You may need to delete media files that this task downloaded previously because their IDs have changed. 1. Select a conflicting media type in the Failed Media Summary list. 2. Select an available media type from the Available media dropdown menu, or select None to discontinue this media download. 1. From the Search Criteria Summary list, select a field with an "x" beside it. 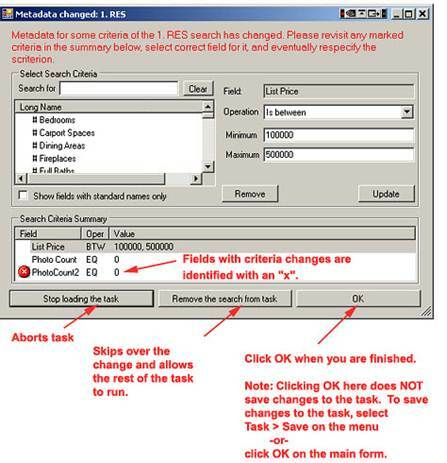 • Click the Remove button to remove the field from the search. • Change the field’s criteria and then click the Update button to adjust the criteria value. 1. Select new field(s) from the Available Data Fields list. 2. 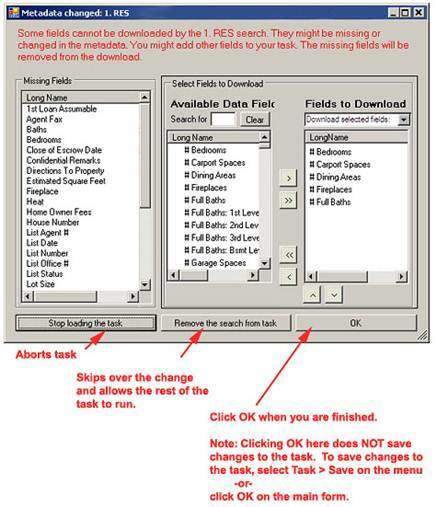 Move the selected fields to the Fields to Download list by clicking the right arrow button. 3. Select an option from the Download selected fields dropdown menu. 4. Click OK to run the task. § Select a Resource/Class from the Class dropdown menu and then click OK.
§ Click Stop loading the task to abort. 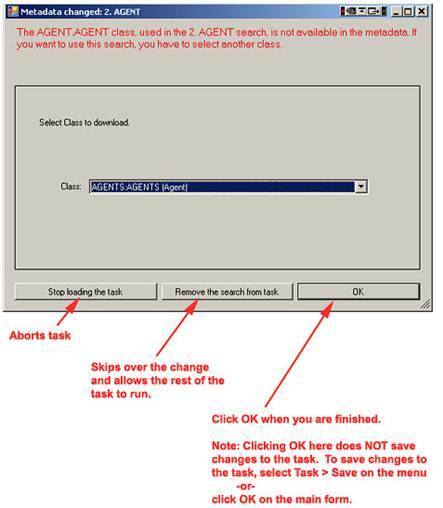 § Click Remove the search from task to skip the change and allow the task to run.